Next week and the week after, we have seven talented quilter bloggers showcasing projects using the new Autumn fat eighth packs from Oakshott. Grab the button below and follow along the seven stops along the bloghop which starts Monday and follows the schedule set out below to find lots of new ideas and inspiration for what to make with these beautiful fabrics. I can't wait to see what they've made! 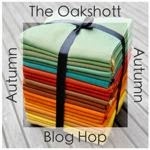 I finally bought my very first Oakshott while at a quilt show this weekend - I couldn't hold out any longer. Thanks for the hop - I'm sure it will be inspiring.